7 Iron Clad is a gorgeous, completely renovated home in Palmetto Dunes. With a direct oceanfront location and expansive views of the Atlantic Ocean, this luxury rental features 6 bedrooms plus a private study with queen sleeper sofa, 7 full and 2 half baths and bedding for 22 guests. This home offers exceptional amenities, such as private pool (can be heated for additional charge), spa, extensive and fully furnished pool deck, gas grill and covered and uncovered porches with sunrise-to-sunset views over the ocean. The 1st floor of this home features a dramatic staircase in the foyer, large living room/great room with sofa, chairs, foosball table and flat screen TV, and 5 bedrooms, all with TVs and en-suite baths. The 2 oceanside bedrooms include a master bedroom with king bed and direct access to fully furnished covered patio with a mounted flat screen TV. The 2nd oceanfront bedroom features a King bed and also offers direct access to the oceanfront pool deck. The 3rd bedroom features a set of bunk beds (Twin over Double) with a pull-out twin trundle underneath and a sleeper sofa in the room, the 4th bedroom features a Queen bed and a Daybed/Trundle, and the 5th bedroom on this level features 2 Queen beds. The 2nd floor features the main living areas of the home and the most impressive views of the Atlantic Ocean. The grand staircase from the entry foyer delivers you to the main living room with adjacent and fully updated kitchen and dining areas. A large laundry room, half bath and kitchen pantry provide ample utility space. Bedrooms on this level include the Oceanfront Master Suite with King bed and sleeper sofa, sitting area and furnished covered porch overlooking the ocean. 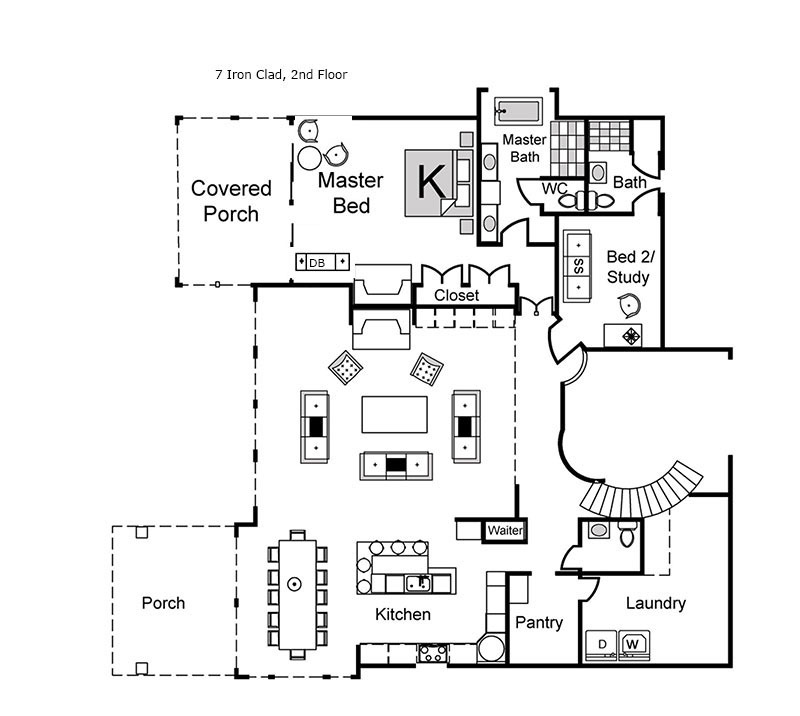 A private Study with a sleeper sofa, full bath, desk and TV are also located on the 2nd Floor. 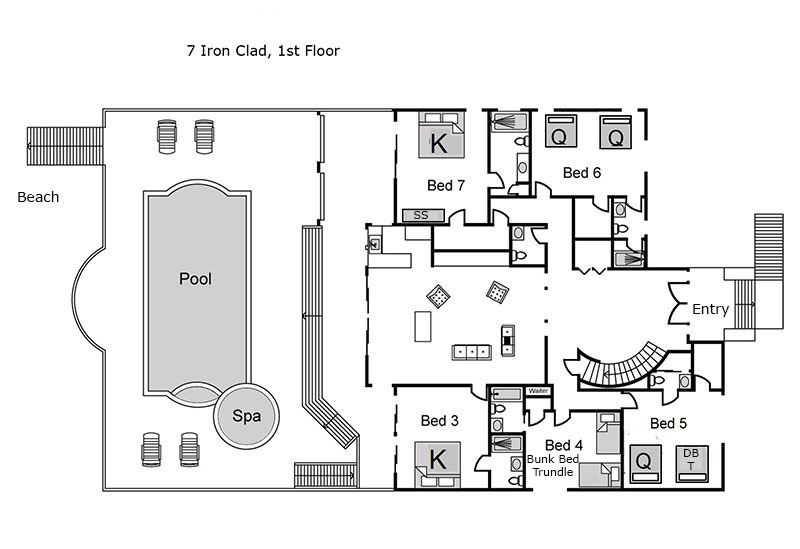 Amenities at 7 Iron Clad will make you feel like you are staying at your own private resort. The 1st floor living room features a 65" mounted flat screen TV and a small kitchenette that is useful when using the pool and outdoor areas. A poolside/oceanside covered patio is fully furnished with mounted flat screen TV so you can enjoy the sea breeze and watch your favorite show or sporting event at the same time! The large private pool features a heated spa and extensive decking. The pool deck is furnished with tables, chairs and chaise lounges overlooking the pool with ocean as a close backdrop. Spa heat is included with your rental and the pool can be heated for an additional fee. The home is outfitted with cable and the latest flat screen TVs, and wireless internet is available at no cost to guests. We've used Destination Vacation for several years and have always loved the attention received from you. The home we rented was the most beautiful so far and the day after arriving, Destination Vacation called to make sure we were happy and to see if we needed anything. We will be back next year! Thank you! We have been using Destination Vacation for ten years. As our family grew (we are up to 18 at the beach now) we moved to a bigger house and last year to 7 Iron Clad. Perfect size for everyone to be together and yet get away some place if you want some quiet. Pool is great, short walk to the beach and great views from the house. Removal of the pool table on the first floor and putting in the pit group was perfect. The younger more enthusiastic could be there and the older folks could be a little more quiet on the upper level. Improvements: Fix the dumb waiter. Manager's Note: We are so grateful for our relationship with your family and thank you for this wonderful feedback! We will address the Dumb Waiter immediately, thank you for bringing it to our attention! The office staff is very friendly and answered all the questions I asked during booking and after I booked as our vacation drew closer. Our house was absolutely beautiful (7 Iron Clad). Everything was clean and in perfect condition. Our TV remote in the main living area was a bit troublesome but it's nothing that affected our vacation! Location was prefect in terms of tennis, golf, grocery store, restaurants, and General Store. We actually prefer Palmetto Dunes over Sea Pines because of the above mentioned amenities. The beach area was spacious and we liked having plenty of space between the other vacationers since we had 16 people in our group. I called Destination Vacation a few times during our stay about trash removal and the lack of garbage cans at the house. As mentioned, we had 16 people in our party so we generated a lot of trash so Destination Vacation delivered more receptacles the same day to accommodate our needs. I will always book through Destination Vacation due the their outstanding service.